In times of struggle, a leader is the most important thing to have. But what makes a good leader? Is it someone who can provide easy answers, or is it someone who takes the tough decisions that could lead to permanent fixes? In director Joe Wright's Darkest Hour, he explores this subject in relation to England in the midst of World War II during a time when the foe was among the most notorious dictators in history and the threat of bombs were constantly over their heads. It's a taught drama, but at the center is a compelling performance by Gary Oldman as Winston Churchill, the aging statesman who comes to shape the war's outcome in one definitive decision. Ironically, it's his first and one that will likely make or break his role as Prime Minister. It's a gripping drama, and one that finds that the best answers aren't always the easiest. In a time where America was defined by such tough figures as General Patton, England was turning their attention to a leader of a different build. Churchill wasn't by any means a man of ideal health, choosing to smoke cigars and dictate notes from his bed to his secretary (Lily James). In some ways he was a man more likely to retire than start a career that would shape the safety of an entire nation. Yet there was, introduced by the flicker of a match being struck. He was going to make a difference that his appearance as a portly, balding man would undermine. There had to be something special about him, but his controversial opinions and tactics would keep him from being the clear favorite in parliament. This was a man that would become a historical icon in time, but at the moment had to make a tough decision one fraught May. Through a grumbling voice and a temper that had less consistency, he changed the world with his stubbornness. The drama is largely conventional for a WWII film. The threat of Hitler lingers in archival footage that plays over the opening credits. He's a man that the audience knows to hate before being dropped into this world. In fact, the decision surrounding the movie may be undermined by how familiar the event that it lead to was a popular movie four months prior (Dunkirk). In that front, Wright's drama is a bit staid and true, finding nothing too exciting to separate it from other films about war negotiations. What starts as a brief criticism of Churchill with spectators commenting on him quickly vanishes in favor of a story that doesn't feel placed inside the war. The world that Churchill is facing isn't significant to the plot in more than the audience's awareness of WWII history. In some ways it undermines the film's strengths, even if this element course corrects eventually. Still, it's a drama about the stakes of war that rarely feels like much is at stake but Churchill's reputation. In fact, the film would be considered nothing but minor Wright had it not been for the smart casting choice in Oldman. Where versions of Churchill like The Crown emphasize his more sympathetic angle, Darkest Hour relishes in his skills as a great negotiator; an orator whose remarks are often full of colorful, powerful imagery that even a poet would be envious of. He is a tough leader, and his speeches capture that inspirational core necessary to believe in the power of the man. Simple acts such as yelling across a table captures Oldman's intensity in a way that shows his general charisma as an actor. At least vocally, this film captures an appealing Churchill who doesn't stand up to bullies and instead finds ways to make him almost human. The issues lie more in the make-up work. 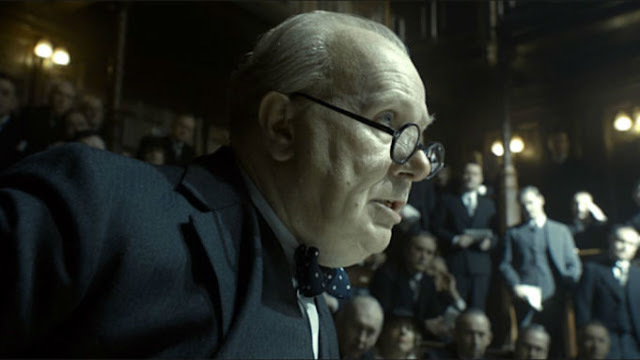 In spite of Oldman's excellent oration, there are issues with comprehending him as Churchill. The work is often gorgeous and reflects the strengths of making an actor appear older and balding. However, it was so good that it failed to allow the actor to emote underneath it. With few exceptions, his performance is undermined by the heavy jowls or wrinkled forehead, which are Oscar worthy but create too much of a struggle for Oldman to shine through underneath. The camera focuses closely on his face, yet there's still a sense that the audience cannot see Oldman's interpretation of Churchill clearly enough. It's a visual performance that is at odds with its dialogue. It's partially why Churchill at times feels too impersonal and lacking a drive to be a powerhouse performance. It's good and convincing, but both sides feel distracting when executed simultaneously. Like all of Wright's period pieces, it's a lavish production that is gorgeous to look at. He manages to make a brick corridor seem mysterious and a privy into someplace emotionally vulnerable. Everything about the appearance reflects Wright's capabilities as a filmmaker to create history in a romantic lens. He even manages to incorporate archival footage and quick cuts that emphasize the impact of Churchill's decisions nicely. The only issue is that there's little here that's exciting for Wright. He found more compelling drama in films like Atonement and Anna Karenina, which were also more gorgeous. Darkest Hour manages to be a war film that wants to be about community effort, but waits too long to develop it. The general message is encouraging, especially in an era where people question their leaders almost every second of every day, and in that respect the film succeeds. However, it's a bit predictable from a story front and Oldman's performance can only improve that by so much. Darkest Hour is a fine period piece that shows a different side to WWII. It's one where the tension felt by the people is only second to those who make the split decisions about how history will be shaped. One could hope to have a leader as staunch as Churchill. His moments of soapbox overacting are breathtaking to watch, even as the performance falls a bit short. It's not necessarily a tale that feels essential otherwise, as Churchill's later life is arguably more interesting and worthy of the biopic treatment. Even then, the film works in spite of its shortcomings, and that's enough to make it one of the more tolerable glorification of a political figure that was seen in 2017. It's not the best, but it has enough to make it at least interesting.